When it comes to Christmas decorating, "budget" is a word that seems to fly out the window. Decorating your home and tree for Christmas doesn't have to cost a fortune or involve lots of shopping trips. Instead be creative and utilise the decorations you already have and other household items that can be re-purposed as a unique Christmas decoration. 1. 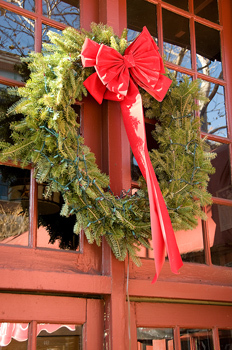 Use broken garlands to drape over doorways or windows and create a grand Christmas entrance. Stick a huge fabric bow on either side of the drape and then position pots of poinsettia underneath the bows. 2. Use broken or worn out garlands to make wreaths or stars. Make the shape you want from a wire hanger, then twist garland around it. Decorate or leave as is. 3. Paper chains and cardboard stars can be dressed up with glitter and fancy (leftover) paints and keep the kids busy in the days leading up to Christmas. Use magazine pages, cut into strips, to make the paper chains for a colourful and frugal decorating idea. After Christmas just put the chains in the recycle bin. 4. Put a newspaper under any project that uses glitter, and when you're through, use the crease as a funnel to return the unused glitter to it's container. Glitter is expensive, and this way you don't waste any. It also helps stop it from being spread around the house. 5. Watch newspaper and advertisements for pictures you can cut out and use. Santa, reindeer and Christmas trees from the newspaper can decorate your refrigerator, windows and walls. 6. Borrow a book of origami from the library and make simple doves and such to hang in your windows. 7. Use salt instead of glitter for snow scenes. It's much cheaper!